Do you imagine yourself living alone? In that imagination, are you happy and complete in yourself? Do you feel that the rhetoric of society that makes us feel that we need other people is useless? Do you ever want to live like a hermit? Would you prefer the silence of the countryside to the noisy hustle and bustle of the city? Would you prefer spending your time reading a book rather than going to a crazy noisy party? Do your parents worry about you not making enough friends? If this sounds anything like you, I think you have less reason to worry now. For a very long time now, you have worried about not having a social life. You really stress yourself out on every Friday about your weekend plans and you are worried that the pace at which the world is functioning is not your speed at all. But, I guess all of this is just fine. Society may easily deem you as anti-social but society doesn’t know that it is proven that you are a genius. Yes, throw this into everyone’s face now. 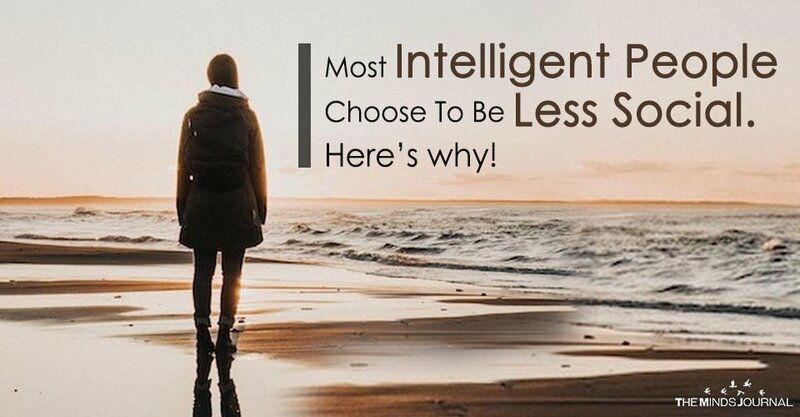 According to a recent study, the genius category amongst us finds it extremely hard to associate and socialize with other people. It is not because of the idea that they are anti-social but it is actually because this category does not get any satisfaction out of social engagements as they deem these engagements to be petty and puerile. They are unable to adjust to the pressure of such social interactions and hence dismiss them. The study works on the premise that people are happier when they live in less densely populated areas. Thus, happiness quotient increases as soon as the population of people around you decreases. Also, happiness increases when interaction decreases. This means that people who interact less are far happier than people who spend most of their time socializing. This is because the people who socialize less live a far simpler life with less stress and confusion but this is not true for people who socialize more. The basic thing that the study proves is the fact that some people do not always want to spend their time placating and adulating other people. They really have better things to do. It is psychologically proven that in order to be able to interact with other people in a better way, you need to carry a pretense; an “image” of yourself which other people will like. This means that most of our social relations are based on approval. So all we seek from the people around us is approval and we spend most of our time and energy in order to get this approval from other people. In the process of seeking this approval, we totally forget to be ourselves and thus our identity gets distorted. We become less of the person that we actually are and more of the person that other people want us to be and this is not necessarily good because such kind of habit will make us less unique. All the unique, quintessential gifts that we have will be lost to homogeneity. We will be more alike and lose ourselves forever. But the genius knows this problem so very well.